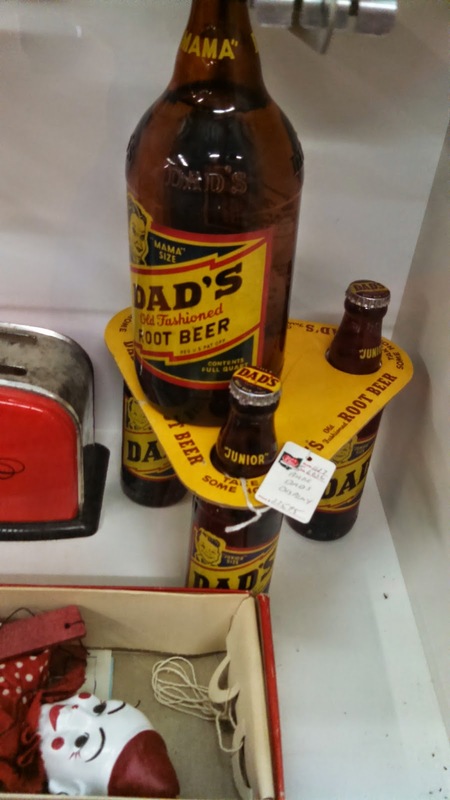 Here are several Root Beer items I saw while traveling, but did not buy because they were very high priced. I thought I would at least take a picture so I could say I saw one. Very cool cardboard sign, The next one is cardboard also. $700.00 for the pair. Ouch. 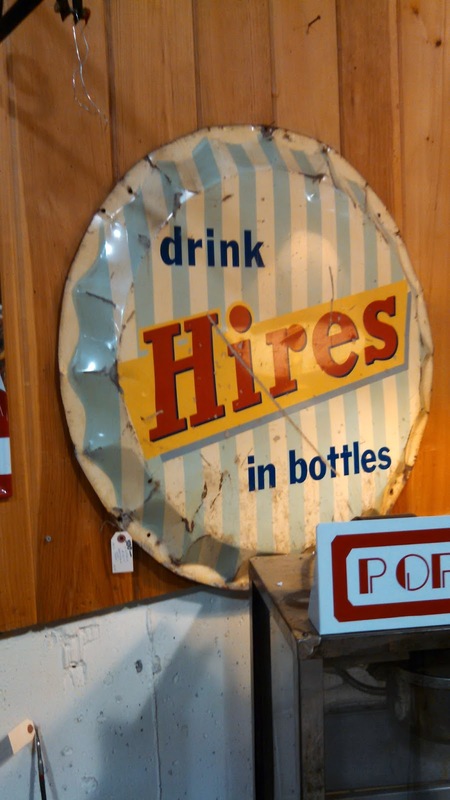 First bottle cap sign I had seen but $500 was too rich for me. I really wanted this one but $400 was just to pricey for me. Turns out I have one of these but this one was way more than what I paid. We recently took a trip from Colorado to Ogunquit Maine. Along the way we stopped at many Antique and Collectibles shops. We found a few treasures. 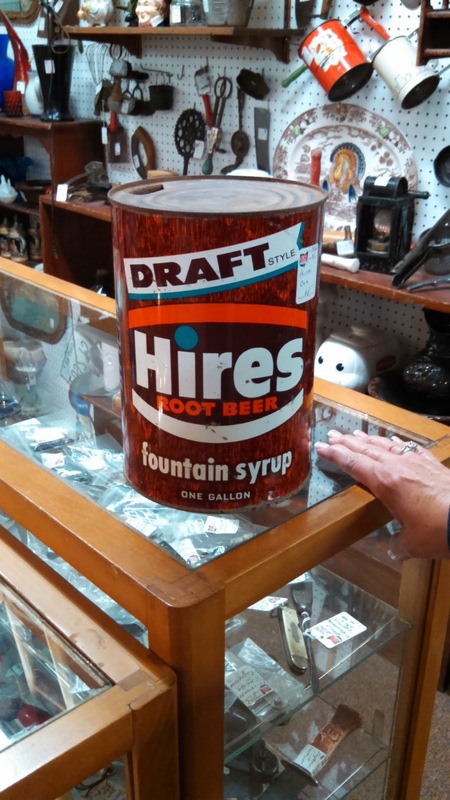 We went to many shops in Pennsylvania hoping to find some cool Hires items, but we did not. What we found on Hires as in Ohio at the Heart of Ohio mall just south of Springfield. Here are some of what we found. Fist time I have seen: HI-Top Root Beer and Leary's Root Beer. This is the first RICHardsn bottle I had ever seen. 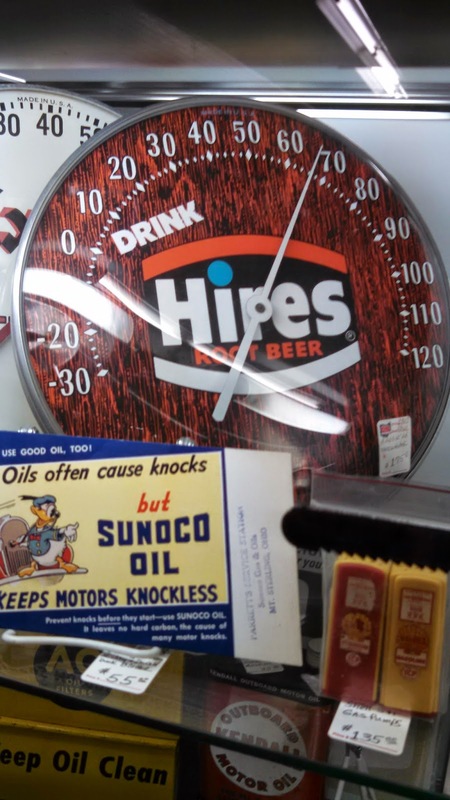 Finally, a paper label Hires from the 1930s and a clear ol'Smoothie. I already have a brown ol'Smoothie bottle. 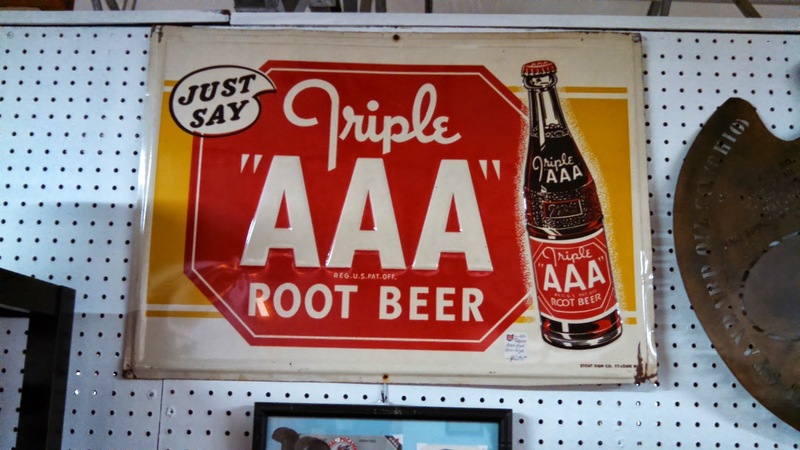 I saw a lot of Ma's Old Fashion Root Beer bottles. I really like the Walker's Root Beer. I had not heard of this brand before either. The Hires can has Roberto Clemente on the back. Silverfross Root Beer mug, Richardson's Liberty Root Beer and a German Hires mug. I love Root Beer candy and found the Russel Stover at the factory in Abilene Kansas. The other two I already have but bought more since they are not found in the Colorado area very easily. All in all it was a fun trip. I saw a lot of things I did not buy, mostly because they were too pricey. I will do a separate blog entry on those items. 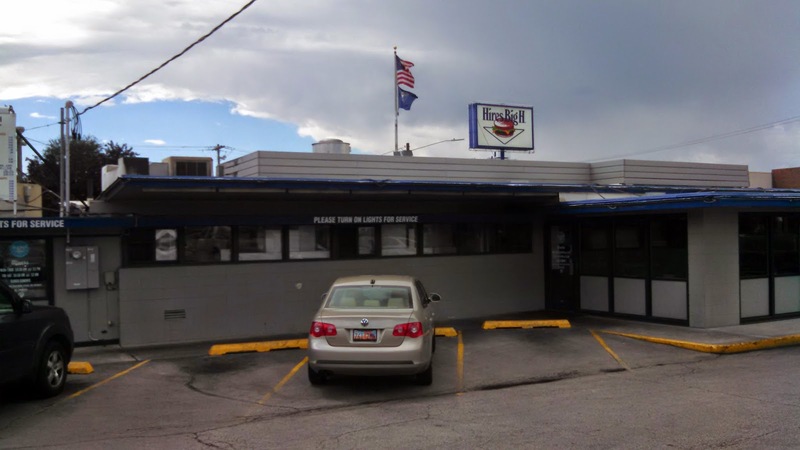 (www.hiresbigh.com) drive in hamburger joint. It was really good. I had heard about it a couple years ago but this is the first time I have had a chance to go there. I took a picture of this below sign that explains why the name Hires is in the drive in name. I also took the opportunity to pick up a few other items, like the T Shirt below. And when I paid my bill I asked if I could have one of each of their drink cups. No Charge! I like this place. I had a root beer float, of course, and will definitely go back whenever I get the chance. I also found a couple Root Beer brands I did not have. One is from the Lion House next to the Joseph Smith building and the other was from Deseret Books across the street. Then top it off I also found some root beer extract at Orson Gygi's. All in all a fun trip. I recently went on a trip to Missouri with my son to do some maintenance on his property. While there we were looking on the internet for any root beer events in the area. 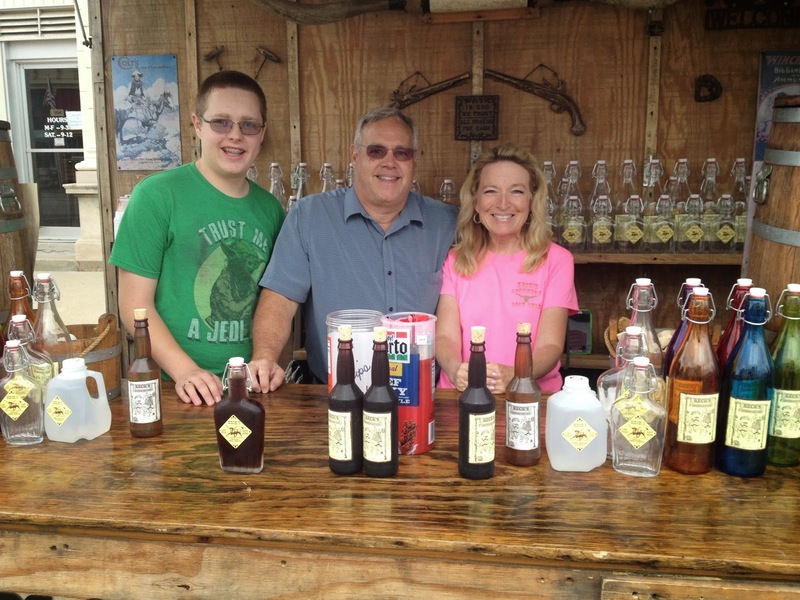 We found that there was an event going on at Odessa, Missouri the next day and that there would be a root beer wagon at the event. Since Odessa was only about 30 minutes to the east we decided to go. We met Connie Keck and had a great time talking and drinking Root Beer. She brews her own root beet and brings it to the show in kegs. Then as you order it she fills the bottle of your choice and puts a cork in it. It is a great tasting root beet, and I have drank a lot of root beers. A nice smooth taste that does not have too much carbonation. Of course I had to bring some home so Cindy could try some. If you want some you will have to find her at an event. Her web page shows her calendar so you can see where she will be. This was a great find. Over the last week or so I have added two great treasures to my collection. 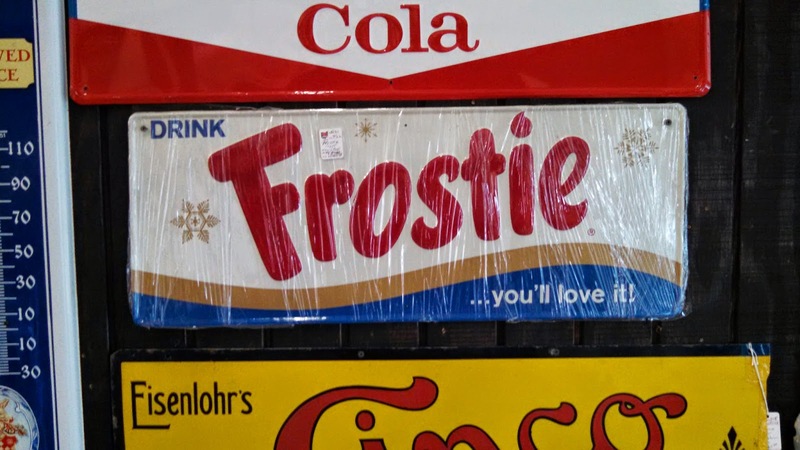 First is what I think to be a Frostie Root Beer barrel marker. It is solid metal, it looks like brass. Is 4.5" high, 13" across and is in the shape of an arc that is about 17" inches in length. It could be a print head for printing the logo on boxes or crates. In any case, it is very unique and the only one I have ever seen. A nice gentleman from Huntsville, Alabama found my blog and contacted me. We were able to come to terms and now it is mine. I love it. Thanks Donald. The second great treasure is a John McDonald Root Beer paper label bottle from around 1915. It is in a Leadville Embossed soda bottle. My brother-in-law found this for me while he and his wife were passing through Leadville, Colorado. This one is pretty hard to find also. Thanks Greg. Thanks to all the people viewing my blog and sending me emails and and pictures. I love to hear from you. I recently went on a several day trip through the states of Wyoming, Utah, Idaho, Oregon, Washington, and Montana. Our main purpose was to visit family and friends. But of course we had to stop of antique stores along the way. 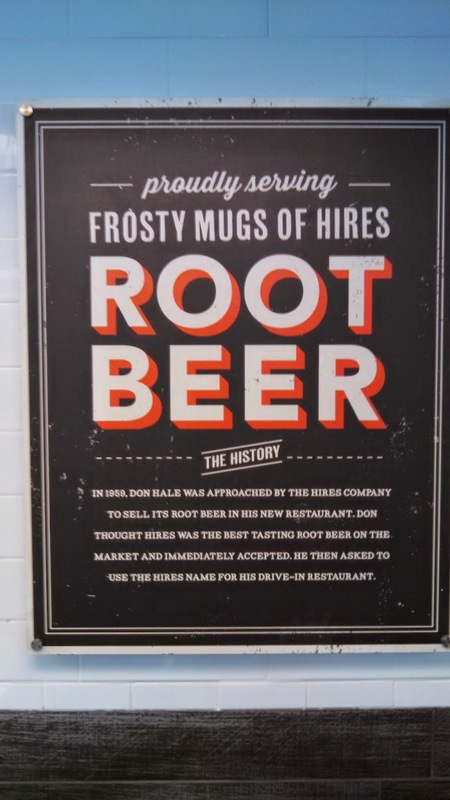 We also went to the Root Beer Store in Lynnwood, Washington. Very fun place. 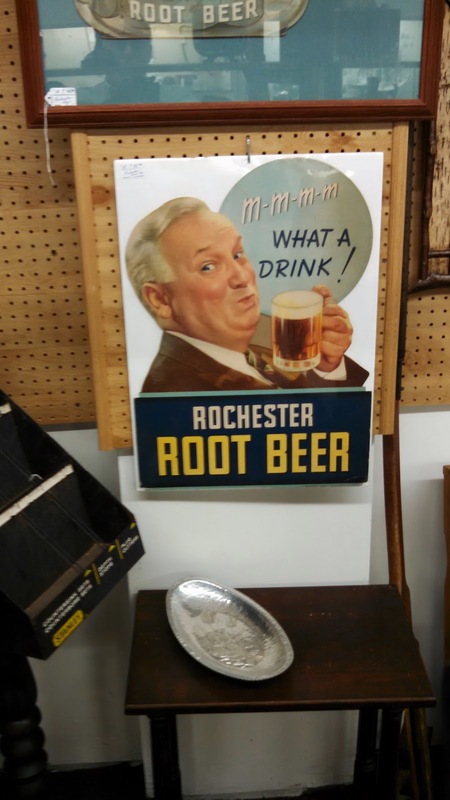 I found many root beer items and brands I did not have. Here are a few of my finds. From the Root Beer store I was able to add 10 new brands of root beer I have not tasted. This was a welcome addition to my fridge in the garage. I found a few bottles at various places along the way. A couple of the bottles were very large. Then at our last stop I found the bottles that got me excited. First was the brown Barq's bottle which I was sure I did not have. When I got home I discovered that I did indeed have it. I really need to start checking the blog before I buy to ensure I do not wasted money on duplicates. 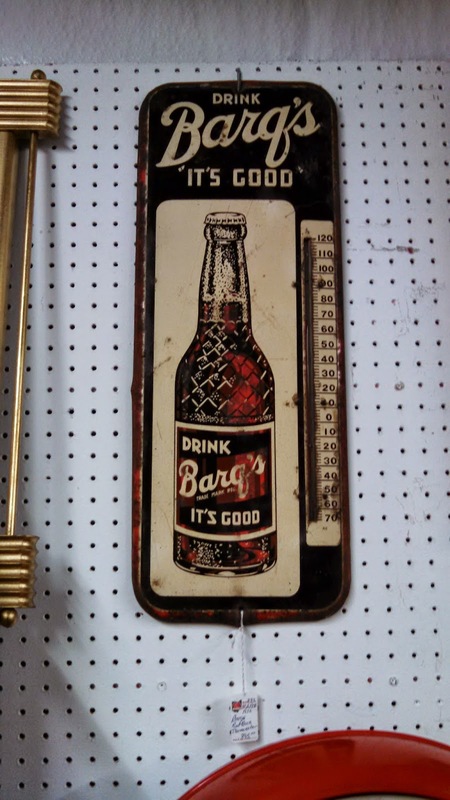 It is a very old Barq's bottle so perhaps it will sell in my fleamarket booth. Next to the Barq's bottle is a Rosebud Soda bottle with an old Hires paper label. I was so excited to see this that my desire to have an old Hires bottle over ran by ability to think clearly. Once I got it home and started researching I discovered that the 12 Fl oz label in on a 7-1/2 fl oz bottle. Although the label appears real, and the bottle is still a very nice Rosebud soda bottle, I believe some simply stick a Hires label on a bottle to make it sell easier. Bummer for me, but then I gain knowledge through trial and error. I found two new Dog n Suds mugs that are large and a nice addition to my collection. I thought $3.00 for this MUG glass was reasonable. I have not seen another one of these before. My most fun was at the Root Beer Store. 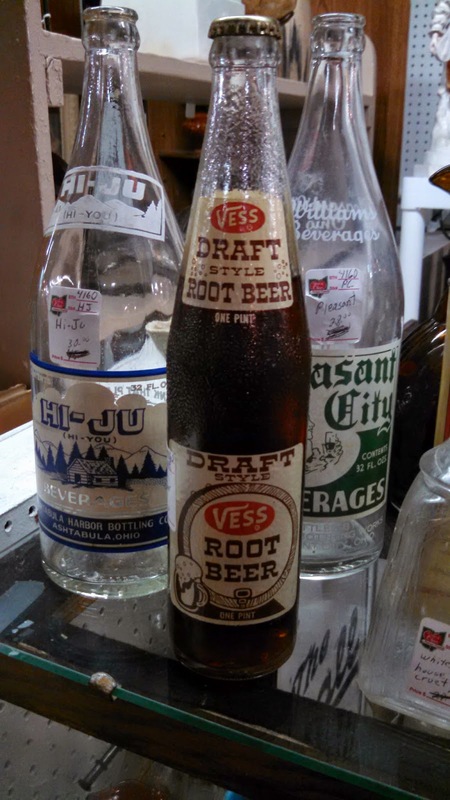 In addition to the root beer mentioned above, I found several root beer items to add to my misc. collection. I am looking forward to our first Bar B Q so I can try out the root beer mustard and BBQ sauce. Here is the piece I really enjoyed finding. It is a thin plastic Hires calendar from 1970. This happens to be the year Cindy and I were married. I told her I was buying it for romantic reasons. She did not believe me for a second. I hope you enjoyed this blog. It was sure a fun trip. I am now thinking about where else I can go. I was walking through Hobby Lobby the other day and saw this sign. It is not a new one and only cost $15.00. 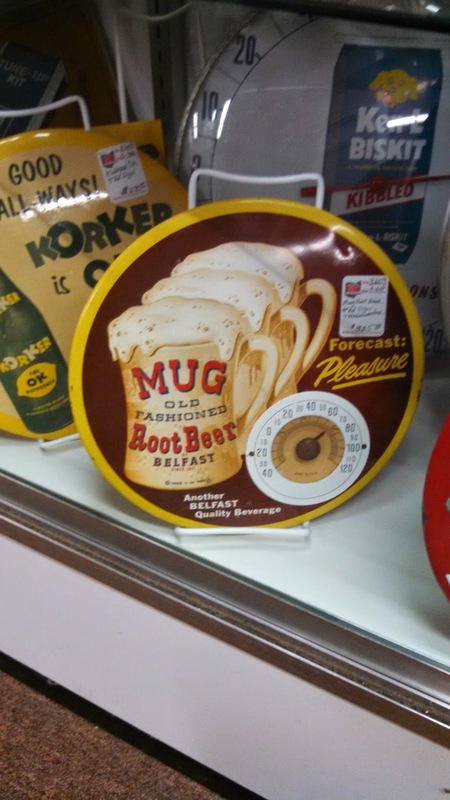 Although it does not say Root Beer on it, I have several Dog n Suds mugs and through it would look good on my wall. I was right. 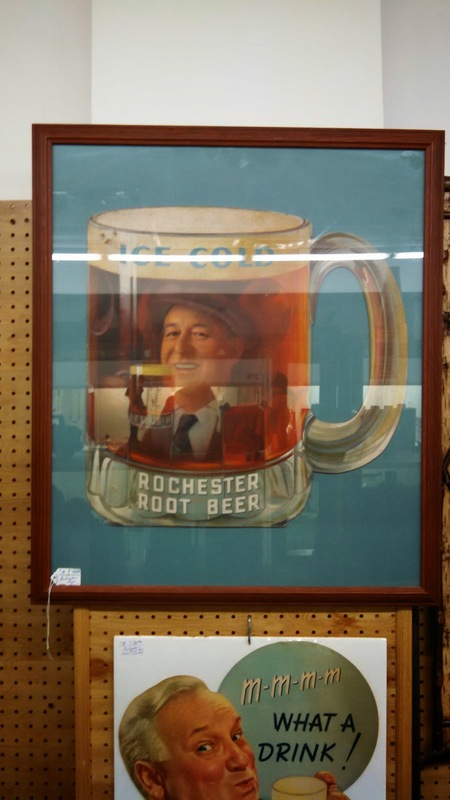 Last week while walking through the Front Range Mercantile Fleamarket in Longmont, I saw this metal framed glass cabinet. I fell in love all over again. Even my wife, who told me I cannot buy any more furniture let me buy it once she saw it. I had the perfect spot for it already in the Root Beer room. Here are some of the Root Beer candies I have been able to find. If you keep your eye open you can find root beer in lots of places. These tins of root beer syrup are not a recent purchase, but I wanted to add them in to the blog so when I travel I will be able to bring them up on my iPad, along with the rest of my blog. I try to avoid buying duplicate items. You can see to the left in this photo that I outgrew the two cabinets. I had to add a few shelves to hold the growing collection. Now I need to start working on Cindy until she agrees that a third cabinet would be a good idea. Had a wonderful trip through Nebraska, Iowa and Illinois. Here are some of the treasures I was able to find and bring home. As my Son-in-law so nicely explained to my wife, I am preserving American History. Some of the mugs I found. The Hires one is nice because they are getting very hard to find. 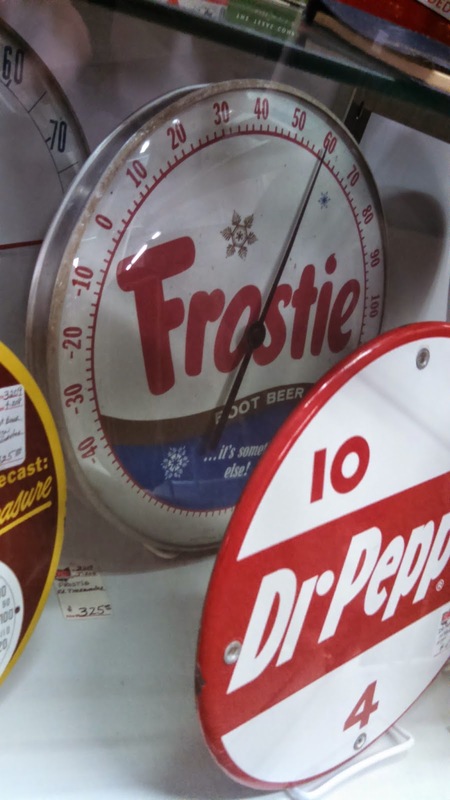 The bottom picture shows a Frostie Root Beer Mug. It is sort of in the shape of the Frostie Elf. This store is located in Galena, Illinois. 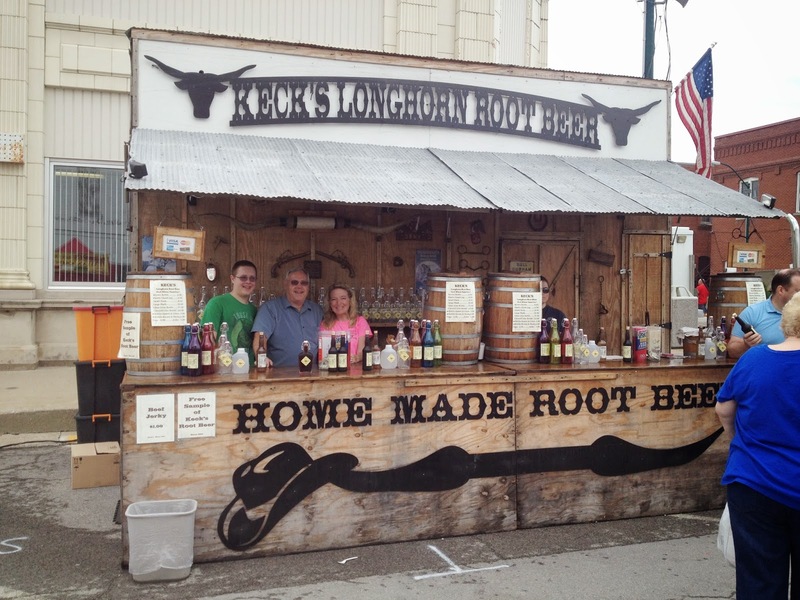 It's primary focus is on selling root beer. 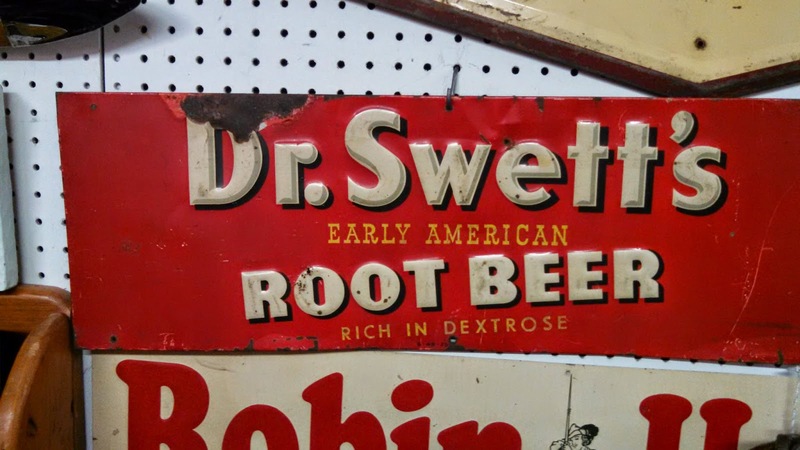 They have a very nice collection of old cans, bottles and other root beer items. They also sell many brands of Root Beer. I picked up a case of root beer in preparation of our annual Root Beer and Pizza night in April. This Frostie bottle topper is awesome. I have not yet been able to determine an exact date for it. I am guessing it is from the 1950's. It is my new favorite item. One guess where I found the Huskies Root Beer bottle. In the Nebraska antique malls and fleamarkets, every booth had at least one Husky item. Some we like a Husky shrine.